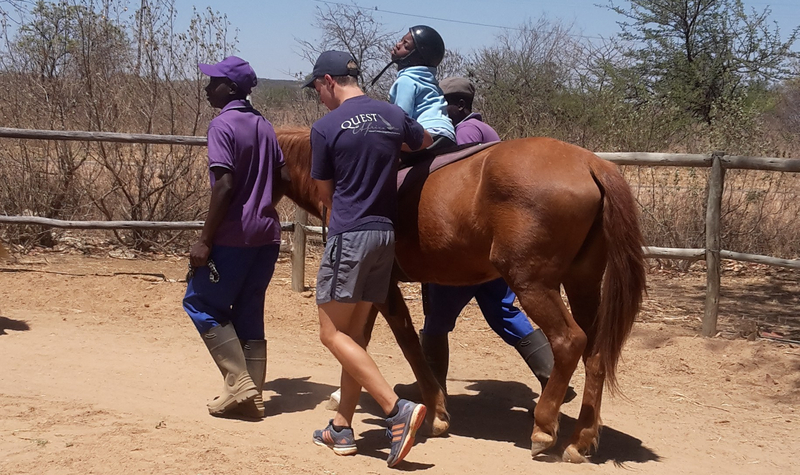 Healing with Horses Zimbabwe has had the privilege to work with Quest Africa during 2018. Quest come out to help us during our Wednesday morning sessions with KGVI, and it is such a pleasure to have these strong young muscles with us! These young people come from all over the world to take part in the Quest Africa Course at Falcon College Campus, Esigodini. Thoughout this year they have travelled all the way from Esigodini to the outskirts of Bulawayo where Healing with Horses is located, on several occasions. As we are always short of side walkers for our sessions we are always happy to see the Quest bus roll up! But third term 2018 brought a new dimension to our relationship. During their orientation session with Healing with Horses and KGVI, the members of Quest found their heart strings being tugged, to the extent that, a few days after this session we got a request from two of these special people, Simone and Trinity, to hold a fund raiser for us. A request? Wow! It’s a privilege to have this offer, thank you so much for your commitment towards our program. We were awed to discover a few days later, that Quest’s idea of a fund raiser is to hold a run from Bulawayo to Victoria falls. Not only is this 437km of running, but this part of the country is known for it’s harsh conditions and sweltering weather. Please, Bulawayo, Zimbabwe, the world, support these courageous kids in their Quest to raise funds for the children of Zimbabwe being served by Healing with Horses Therapeutic Centre, Bulawayo. Healing with Horses has a mission to heal children and communities in Zimbabwe through Equine Assisted Activities and Therapies. The children we serve have various disabilities, physical, emotional, learning, special needs. We offer therapeutic riding sessions free of charge to these children in order to make a difference in their lives, the lives of their families, and the lives of the community. Please support Quest’s fund raiser, which will make a huge difference to our program. Healing with Horses Zimbabwe is proud to be associated with Quest Zimbabwe. Thank you Quest, for your support of our program. Please contact us or Quest for more information on how to help with the program and the fund raiser, details on the poster and write up.